The twelth annual World Autism Awareness Day is April 2, 2019. 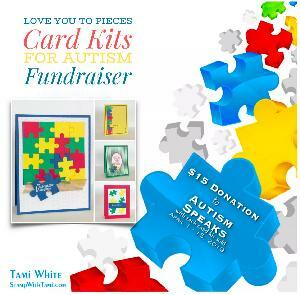 I'm kicking it off with my annual autism fundraiser card kit, this year it is "Love you to pieces" card kits fundraiser. We can make a difference and celebrate autism with awareness, research, education, appreciation, inclusion and acceptance. From April 1-15 when you order my Special Edition Love You to Pieces for Autism Kit I will donate $15 for each kit sold to Autism Speaks.OR make a $25 min. donation here and I'll email you the free pdf tutorial. My goal is to raise $1,500 for Autism Speaks. Visit www.stampwithtami.com for more details on the kits.